In a city based dental elective placement, you will be working under the direct supervision of a team of dentists who are associated with our partner dental hospital in the cities of Kathmandu and Pokhara. WHAT TO EXPECT IN THE PLACEMENT? Our dental placement in Nepal are based at a busy dental hospital and local dentist practices in and around Kathmandu and Pokhara cities. The local practices are very similar to those you probably visit at home but the main difference will be the level of sophistication of the tools they use. Like your dental practice at home, the clinics are usually divided into general dentistry (check-ups, fillings, extractions etc) orthodontics, & prosthodontics and you will have the opportunity to gain experience in both areas. Often, the supervisors of our rural dental projects also teach at the local dental school so during placement time, Pre-university students will also be given the opportunity to accompany him/her to lectures during the day along with the elective students. AGP – Dental Outreach provides volunteers with the opportunity to shadow dental professionals and assist them in procedures such as extractions, cleanings, fillings, radiography, and sealants. In the clinics, volunteers will perform basic triage, assist the dentists, and manage the pharmacy, as well conduct oral hygiene instruction classes in elementary school during school visit at the end of the placement. All volunteer work is under the direct supervision of a licensed dentist. Volunteers sit right next to the dentist and assist as he or she diagnoses conditions, performs procedures and discusses follow-up treatment. Volunteers will have countless opportunities to ask questions and learn as much as they would like. Volunteers meet patients as they come into clinic, take their personal medical and dental history and record their current appointment specifics. They learn how to measure blood pressure readings and analyze blood sugar levels. Volunteers will learn these skills and then apply them under the direct supervision of a registered nurse. Volunteers learn and apply the proper techniques for sterilizing different instruments post-procedure. 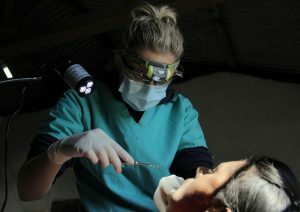 Volunteers also learn about the instruments used for each procedure, and prepare the instrument trays for the dentists. Towards the end of the hospital placement, the hospital team along with the volunteer will travel to a local school and teach children the importance of hygiene, dental health, hand washing, nutrition or another subject the team decides to teach. Ideally teams will bring something to distribute to the children such as toothbrushes and fluoride tooth pastes. The removal of cysts on the jaw, benign small tumors etc. To apply for this placement, click on “Apply Now” below. Fill in the short application form and one of our advisers will then call you back to answer any questions and make sure this is the perfect placement for you. Applying doesn’t cost a penny and you won’t pay anything until you’re completely happy and you’re ready to reserve your place.